For those of you who remember the Houghton of old, then you are in for a major surprise. The newly designed and newly laid out Houghton Golf Course is a completely new golfing experience. Notwithstanding the one or two holes that have been altered on the old course, nearly everything is new and different. The course has made space for a world class club house, an exclusive hotel and some luxury apartments for the crème de le crème of South African society, but has in turn given up much of its space for golf holes. 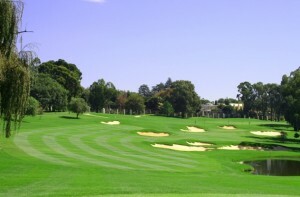 The course is now not as spacious as it used to be, but they have made up for the lack of space and sometimes distance in the most part by heavily guarding the greens and fairways with deep soft bunkers, thick rough and selective undulations. The well protected greens are very difficult to putt on, and when they are running fast, the are nightmarish. Some have said they are a bit ‘Mickey Mouse’ and more suited for a putt putt course, but in truth, without difficult greens, the course would be a tad easy. Even with the small flaws, Houghton is a beautiful course in superb nick. The directors, green’s keepers and staff at Houghton have put together a world class track, that plays more difficult than a par 72, but is a highly rewarding day out. 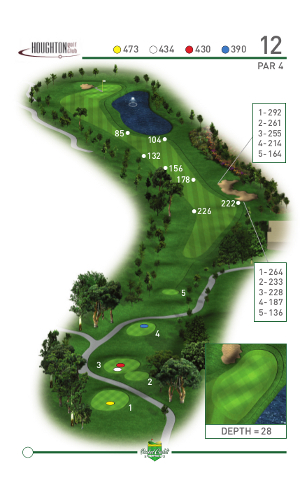 The par 4, stroke 4, 4th hole is the stand out hole on the front nine. From an elevated tee box, you look down at what appears to be a wide and inviting fairway. With stunning views across most of the course, you can see Jack Nicklaus’s thinking during the design of the new Houghton. The hole represents everything the course is about; beauty, risk, reward and a challenge. From the elevated tee, you need to carry 250m on the right to clear the fairway bunker from the club tees avoiding water short of the fairway and trees on both sides. Once down on the fairway, you have to hit back up hill to a well guarded green that slopes from back to front with a dangerous bunker right in front. Par is a fantastic score. What a hole the Houghton stroke one is! It is beautiful, difficult and balanced. It requires both brains and brawn to walk away from this one with your score, round and dignity intact. The hole doglegs sharply to the left, with huge trees guarding the dogleg’s left hand side and a mammoth fairway bunker protecting the right side. 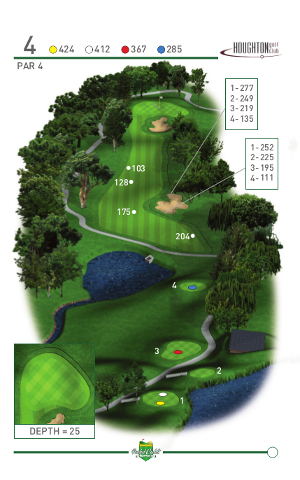 Any drives too long will find the fairway bunker, and taking an iron off the tee will mean a 222m plus approach iron into a very difficult green. The approach will need to be made very a long stretch of water, with a deep bunker behind the green. The green slopes straight back into the water and you will need to give your approach shot enough legs to prevent spinning back into the water, but not too much that it may miss altogether and end up in the bunker. Bogey is not a bad score for the amateur golfer on this impressive hole.